Our distinctive KSW Services van parked up for the night after a long dayEstablished over 10 years ago, KSW Services is a family run business that works on reputation, with much of our work coming from word of mouth. Run by husband and wife team Stephen and Susan Wilson, we offer a friendly and professional service, where the person who quotes is the person who will be doing the job. Stephen is a City & Guilds qualified joiner and decorator with over 25 years experience and Susan worked for many years in the commercial cleaning industry. We handle all aspects of work, including plastering, tiling, plumbing, painting, decorating, wall-papering, electrics and more! All electrical and gas work is signed off to Part P and Gas Safe standards and we're fully insured with public liability and professional indemnity. We offer an honest approach to our home improvement services, working within your budget to ensure the best outcome for your resources. If we don't think a job needs doing or that there is a better or simpler solution, we'll tell you. We'd much rather you went on to recommend us than have a horror story to tell. From replacement door handles to full property refurbishments, carpeting a room to refitting a hotel, we happily tackle large and small projects alike. 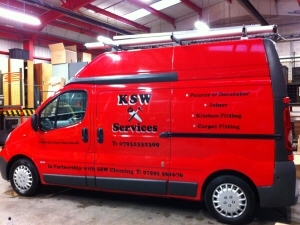 Please call KSW Services with your requirements. We offer quality work at a reasonable price and take a genuine pride in a job well done. For example, we always strip walls to get nice straight lines when tiling, fit new underlay when laying a carpet and mask off glasswork and edges for even the smallest of painting jobs. 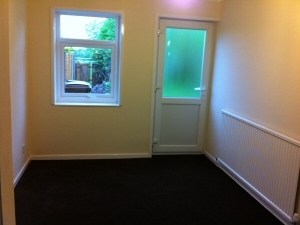 Room re-plastered, painted and carpeted as part of a full property refurbishment in PrestonWe also use high quality materials for a longer lasting finish, preferring Dulux paints to own brands and zinc plated exterior screws to prevent unsightly rusting. KSW Services will treat your home as though it were our own, leaving it as clean and tidy as possible at the end of each day. We realise works in your home can be a stressful experience and we always attempt to minimise the impact on your daily routine. For kitchen and bathroom work, wherever feasible, we will ensure you have running water and a flushing toilet by the end of the first day. And whatever the work, all rubbish will be cleared from your property. Whether it be old carpets, kitchen units, bathroom suites, fence panels or boilers, we'll arrange for their removal and disposal, leaving you with a clean and tidy finished room ready for use. If you're looking for a reliable tradesman to maintain or improve your hotel, cafe, nursery, offices, shop or other commerical premises, please call us for a competitive quote. We are fully insured, have considerable experience working for business and can provide suitable references on request. Testimonials from a number of customers are also available. For examples of our work, please take a look at our Photo Gallery page.